"Time takes everybody out. Time's undefeated." That's a quote from Sylvester Stallone in the new film Creed, which is one of the best films this year. Creed is a continuation of the Rocky film series, but this time, it focuses on Apollo Creed's son, Adonis Johnson (played by Michael B. Jordan). Adonis was the product of an affair between Apollo & another woman. Adonis never met his father, as Apollo died in the ring against Ivan Drago (in Rocky IV) before Adonis was born. When Adonis was young, his mother passed away, & Adonis bounced between foster homes, group homes, & juvenile detention facilities before he is taken in by Apollo's former wife, Mary Anne Creed (played by Phylicia Rashad) in 1998. 17 years later, in 2015, Apollo quits his desk job to become a boxer; he has already participated in bouts in Tijuana. After being turned down at an elite boxing gym in Los Angeles, he travels to Philadelphia & meets Rocky Balboa (played once again by Sylvester Stallone), & asks Rocky to train him. Rocky declines, but eventually agrees. He trains at the Front Street Gym, with Rocky's friends as cornermen, & Adonis finds a love interest in Bianca (played by Tessa Thompson), an up-and-coming singer/songwriter who is slowly losing her hearing. Adonis defeats a local fighter, & because of that, it is revealed that he is the illegitimate son of Apollo Creed. He gets a call from world light heavyweight champion "Pretty" Ricky Conlan (played by British boxer Tony Bellew), who is being forced into retirement due to an upcoming prison term for gun possession. 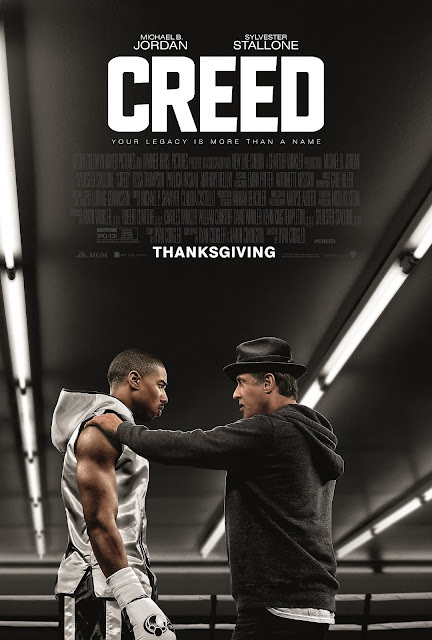 Conlan offers to fight Adonis in his final fight before he goes to prison on one condition: Adonis must change his last name from Johnson to Creed. Adonis is reluctant at first, having wanted to make a name for himself, but eventually agrees, & the fight is on. The film was excellent. The acting, especially from Michael B. Jordan & Sylvester Stallone, is excellent, & Stallone may win his first Oscar for reprising his role as Rocky Balboa. The direction & screenplay from Ryan Coogler is also excellent. I think that the film may be a nominee for the Oscar for Best Picture. Overall, Creed is an excellent film, & it is the best film in the Rocky series in a long time.